Tobias Maguire was born June 27, 1975 and is an American actor. He began his career in the 1990s, and has since become best known for his role as Peter Parker/Spider-Man in the Spider-Man films. Toby was born in Santa Monica, California to parents Vincent and Wendy Maguire. During his childhood, Maguire entertained the idea of becoming a chef and wanted to enroll in a Home Economics class as a sixth grader, His mother offered him $100 to take a drama class instead and Toby agreed. 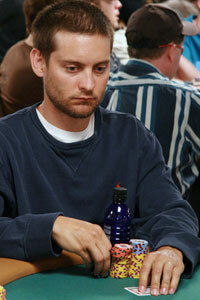 In 2004, Maguire took up tournament poker. He has finished in the money in several events and has been tutored by poker professional Daniel Negreanu. Maguire can be seen on ESPN’s coverage of the 2005 and 2006 World Series of Poker Main Event Championship. Moreover, professional poker player Phil Hellmuth said during the June 28, 2007 episode of Poker After Dark that Tobey has won $10 million by playing poker in Hollywood. Maguire played in the 2007 World Series of Poker. He survived days 1a, 2a and 3 but was eliminated in 292nd place on the fourth day, taking $39,445 in prize money. He actually ended up sitting next to another celebrity, Sully Erna, the singer of Godsmack.